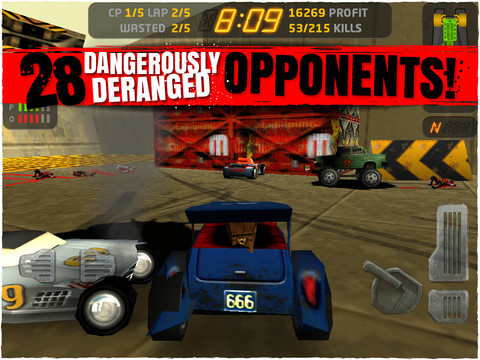 The classic ultraviolent racing game Carmageddon [App Store] has been resurrected on the iPhone and iPad following a tremendously successful Kickstarter campaign. Stainless Games, the original developer of Carmageddon, is still in business and recently bought back all the rights to the game -- with the help of a Kickstarter campaign that raised $625,000, the game is back. The firm plans to bring it to Windows, Mac and Linux in the coming months, as well. The game is absurdly violent, but in an animated, slightly ridiculous way. For today only, Carmageddon is offered free as a thank you to the game's Kickstarter backers. If I remember correctly, Carmageddon 2 was the pinnacle of the series. I played THE HELL out of that one in college. Wonder if that will see the light of day. A true classic, already downloaded (for free today)! Hope it'll be in the Mac App Store soon, if ever. Imagine GTA san andreas on the iphone and ipad, that would be a dream. Woot! One of my favourite games series of my childhood! It's a really high-quality port to iOS, very polished. The controls are adapted to touch well. They've even included the replay cam. If you're on the fence about it, try it. This is one of the top AAA games in the App Store right now. Downloaded and already won my first race - on 'French kissing a Cobra' max difficulty of course! I remember playing the ***** out of this back in the day so it's great to see this on my phone. Controls quite hard to get set up right - both analog controls and tilt steering (which I usually like) seem over-awkward. Especially as this game loves to degrade your steering whenever you get hit / hit something (hint - this happens A LOT). Finally found the best controls by having both steer and gas on digital - this isn't how I have any other game set up but the responsiveness and decisiveness of the digital controls seems to work for such a frantic game.